The former Catalan foreign minister, Raül Romeva, says that in the upcoming independence trial he will not acknowledge organising a referendum as a criminal offense. “I will not declare myself innocent; I will deny having committed a crime” Romeva told the Catalan News Agency from Lledoners prison. He has been in pre-trial jail for almost a year now. During the conversation with the Catalan News Agency in a visiting room in the penitentiary, Romeva stated that “there is no possibility for a legal defense” in the trial, due to start in the coming weeks. For him, it will be “an unfair trial, a farce.” “To think we will be able to defend ourselves with legal arguments is naïve; what we can do is to politically defend what we have done, but by no means defend ourselves” he said. Thus the former Catalan foreign minister thinks it is unlikely they will be freed after the trial. “We use prison to make politics. They will not let us out of here because we make a lot of noise, they will get us out when we win” he said, referring to the goal of independence. 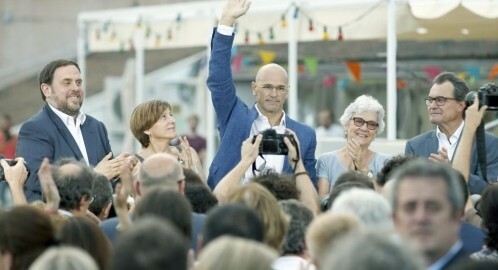 “[The Spanish president Pedro] Sánchez needs a project, not only a budget” stated Romeva, who made it clear that he agrees with the reluctance of his party, ERC, to support the Spanish spending plan. “Without a clear project for freedom and justice, it is obvious that the authoritarian project is the one that will prevail in Spain” he told. “The budget is an opportunity for the Socialists to tackle Spain’s problem, which is not the political prisoners, but the violation of fundamental rights, the prisoners are only a symptom,” he added.